In the August issue of The Local Bulletin we raised the topic of obesity in our pets. About one quarter of our pets are obese and many more are above optimum weight. There are numerous factors that contribute to weight gain in our pets, but put simply, overweight pets eat too much for their metabolic requirements. Many pet owners are unaware that their pets are overweight to begin with, let alone how to manage the problem when it is brought to their attention. A successful weight loss program requires owner commitment, a feeding plan, an exercise plan and strict monitoring. One of the most challenging aspects of a weight loss program for your pet, is remaining motivated enough to continue the program to the end. Results are not going to be instantaneous and it can take as long as eight to twelve months for a patient who is only carrying 20% excess bodyweight to reach their optimum weight. To achieve weight loss over such a long period of time requires a high level of commitment and consistency from the whole family. Another common trap is to not feed the right weight loss diet. Body fat requires very little energy to maintain, so for pets that genuinely need to lose weight, to simply feed less of the same food is unlikely to produce weight loss without creating deficiencies in protein, vitamins, minerals and energy. For this reason it is critical to use a specially formulated, balanced and calorie restricted diet, making sure that it is not supplemented with any treats or table scraps. 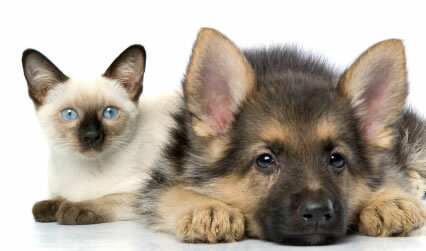 For households with more than one pet, it is also often necessary to feed pets separately. Exercise is an important aspect of any weight loss program, however this can be very difficult for overweight pets. So as not to jeopardise their health further, exercise should initially be restricted to whatever amount of walking, or even just increased activity (such as playing), can comfortably be performed each day with a view to eventually achieve 20-60 minutes of leash walking per day. Having your vet involved in formulating and monitoring a weight loss program for your pet is a proven way to increase the chance of weight loss. Firstly, to assess whether your pet is overweight or not and if so, to determine how much they need to lose. It is also important to ensure that pre-existing medical conditions may not be contributing to their obesity and therefore make weight loss more difficult. For your vet to be involved in regular weigh-ins ensures that advice is readily at hand if weight loss is not progressing as planned, allowing for appropriate changes to be made before any motivation is lost. The benefits of a successful weight loss program not only include improved quality and longevity of life for your pet, but can improve the response to surgical and medical treatments for weight related disease. Better still, it may negate the need for these expensive treatments all together. Asher Dessaix Anstead Veterinary Practice.